Today we are celebrating the radish. Not just any radish. Oh, sure, there are round globes of red white, and the elongated French breakfast variety with both red and white. Lately we’ve been seeing designer colors ranging from cream to yellow, pink to purple. There are long white tapers of Japanese daikon radishes, which are pretty impressive, too. That, my friends, is the Black Spanish Radish. 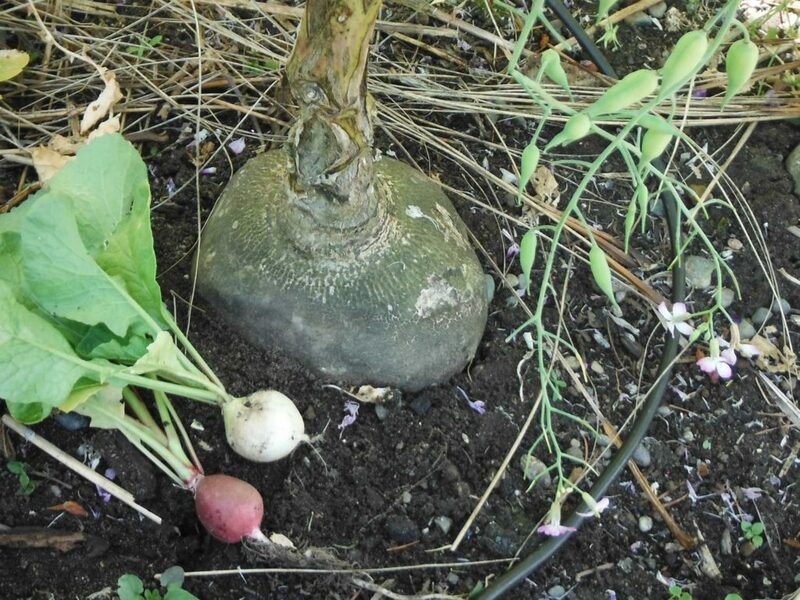 A European variety dating to the 1600s, this radish was introduced into the U.S. before 1828. You can commonly find the round variety, shown here, or seek out the less-available long tapered root. Either will produce a lot of radish for the seed. One taper can be 5 to 7 inches, and I eat round ones that are turnip-sized, up to 3 inches in diameter. The one above, grown for its seed pods and not for the root, was larger than a softball. On the left is a product of this radish that suits me the most: its pods. 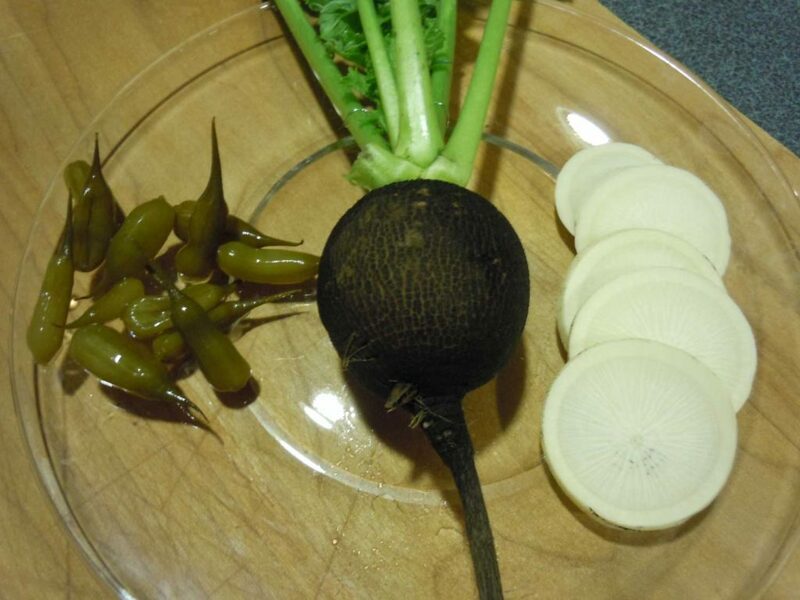 These are pickled pods from last year’s harvest, paired with this year’s roots. This photo is from last October. I always leave one or two plants in the ground and let them go to seed. People who’ve attended my gardening talks in the last couple of years know — I often drag along a big bag of dried radish pods to give away as seeds, and I hope they’re now being grown in many Northwest gardens. But I’m not leaving them in the ground just to get the seed — we eat the immature pods. 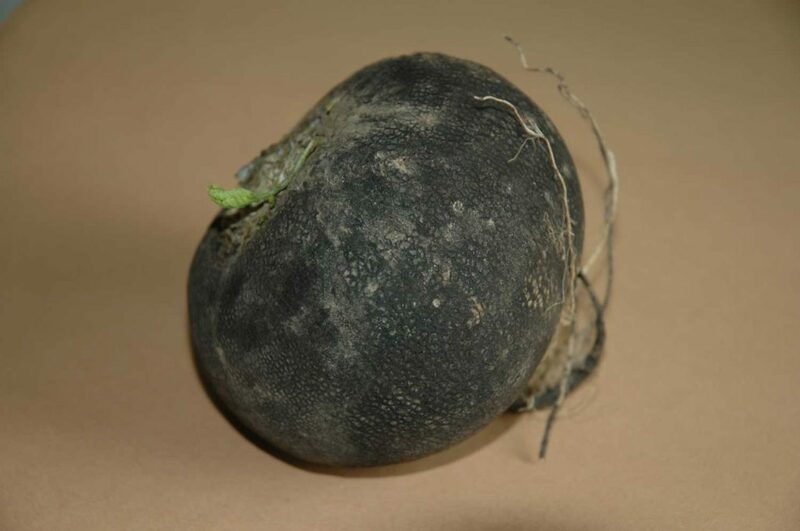 The Black Spanish is best as a winter radish, so planting it in mid- to late summer will mean you can start harvesting the roots in October, or mulch them and let them sit in the ground through the winter, pulling as needed. (I’ve also planted them in late winter, like end of February, and have gotten smaller plants with pods by the end of June.) If you’ve let them overwinter, as the days lengthen they will begin to swell, and in early spring start putting on a lot of top growth. By April the tops are tall and rangy, eventually reaching 6 feet. A halo of purple-and-white, four-petaled flowers will get the early pollinators buzzing. Then come the pods. We begin harvesting when the first slender pods get a baby bump. Even the smaller ones are tasty, but there is a sweet spot in size and maturity that is great for eating fresh. In salads, they add a hint of radish zing and a pleasant crunchiness. Or just set out a bowl of them for a unique snack. Susie and Connie harvesting pods. Pick and use daily, because they pretty quickly lose their flavor in the fridge. Also, as they get too mature, the skins become tough and the centers fibrous. So we eat them fresh, we can them, and we save plenty of seed to make sure there’s always a little Black Spanish Radish lurking in our garden through the winter.